'Algoma', the General Wager Swayne estate designed by Grosvenor Atterbury c. 1900 in the Shinnecock Hills in Southampton. Swayne was born in Ohio and came to New York in 1880, the son of Associate Justice of the U.S. Supreme Court Noah H. Swayne. A trained lawyer, Swayne enlisted in the Forty-third Ohio Volunteers at the onset of the Civil War. He served under General Sherman in the Atlanta campaign where he lost a leg and went on to receive a series of promotions, ultimately being named Brigadier General. During the reconstruction period he served as Commissioner of the Freedman's Bureau in Alabama. Swayne died in 1902 and the residence was inherited by his son Alfred Harris Swayne, vice-president of General Motors Corp. from 1921 until his death in 1937. Click HERE to see 'Algoma' on google earth and HERE on bing. Photo from The American Architect, 1908. 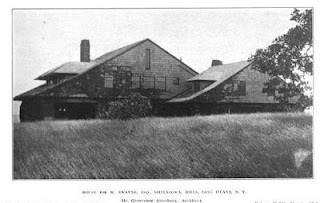 It's located on the south side of Montauk Highway in Shinnecock Hills third house west of Petrel Road. Garden too, but a touch of Jekyll. This place is serious architecture. Always amazing what a master can do using just a few basic shapes, well suited to the site, and a few shingles. And almost across the road from another iconic Atterbury.